London, 1971, 1st edition. 266 pp, 25 photos, glossary, index. Dust jacket, Near Fine or Fine. 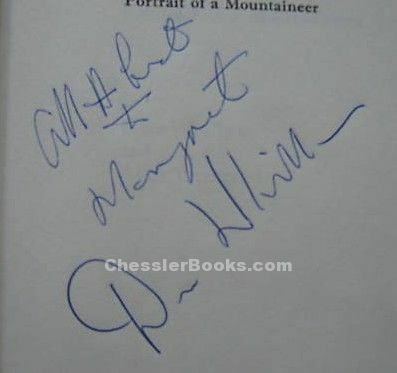 SIGNED and INSCRIBED by Don Whillans in blue ink on the half title page. 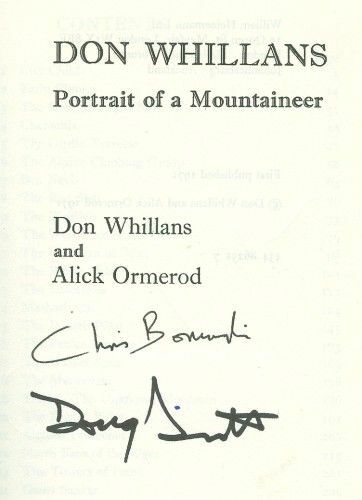 Also SIGNED by Chris Bonington & Doug Scott, on the title page, both of whom did many climbs with Whillans. Scott actually says that Whillans is the one who first took him climbing. A leading figure in mountaineering in the 1950s-60s, who pioneered routes in Britain, the Alps and Himalaya, especially Everest and Annapurna. This is the climbing autobiography of legendary climber Don Whillans. He had a colorful personality and an uncanny ability to crack hard route difficulties by using inventive moves and excellent, innate good route-finding. He pioneered many classic rock climbs in the UK, many with Joe Brown. He climbed several difficult routes in the Alps including the first ascent of the Fr�ney Pillar on Mont Blanc, Bonatti Pillar on Petit Dru, West Face of Petit Dru, Blaiti�re, Walker Spur on Grandes Jorasses, Eiger North Face attempt and rescue of another climber, several severe climbs in the Dolomites, near ascents of Trivor and Masherbrum in the Karakoram, climbs in Yosemite, first ascent of the Central Tower of Paine in Patagonia, Gauri Sankar attempt in the Nepal Himlaya, first ascent of South Face of Annapurna. After writing this book he continued to climb and was on one of the early attempts (big international expedition) to climb the SW Face of Mount Everest. His climbing partners included Dougal Haston, Joe Brown, Ian Clough, Chris Bonington, Wilfrid Noyce, Dennis Gray, Royal Robbins, etc. Whillans died of a heart attack in 1985. If ever there was a climbing legend, it was Don Whillans in the UK. In the 1950s Don was putting up new routes with Joe Brown, at the cutting edge of British rock climbing at that time. Joe and Don also made several first ascents in the French Alps around Chamonix. As well as having a reputation as a top climber, Don also had a fearsome reputation as a hardman, and did thump quite a few people. As a mountaineer Don was a natural, with an uncanny sense of ability on the mountain. One example was Don finding a new route of descent to abseil whilst affecting a rescue with Bonington on the The North Face of the Eiger, enabling the team to descend more rapidly with their injured party. He was also known for this stoic capabilities whilst on expeditions - often surviving for days on cigar smoke and water alone, and was the first to offer his food to others. When it came to cooking however, Don was also famous for his refusal to carry out such tasks. Don missed out on quite a few big British expeditions in his time, but triumphed on the South Face of Annapurna along with Dougal Haston with a British team led by Chris Bonington in 1970. Don was brought up in Salford, Manchester and died peacefully in his sleep on 4th August 1985, at 52 years old. 3. The Rock and Ice Club. 6. The Alpine Climbing Club. 10. The West Face of the Dru. 11. The Old Man of Storr. 19. Trivor - The Unknown Mountain. 22. North Face of the Eiger. 23. The Towers Of Paine. Whillans kept a series of diaries from 1951 onward, and from these he reconstructs his climbs, with ruthless honesty and his north-country humor. It really does capture the distinctive flavor of climbing and climbers.